Moderator Bill Gamson is the chairman of the Vineyard chapter of J Street. Next month an overwhelming majority of members of the United Nations is expected to vote in favor of recognizing Palestine, including areas now occupied by Israel, as a sovereign state. In Chilmark this week, a much smaller group of people searched for signs of hope in this latest development in the long Middle East standoff. They did not find many, for Israel, Palestine or the United States. 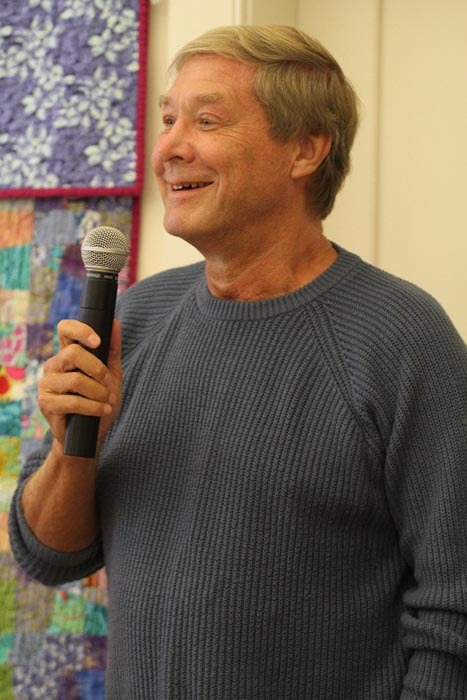 Best-selling author, former government attorney and Vineyard resident Richard North Patterson was the keynote speaker in a panel assembled by J Street, the nascent pro-Israel, pro-peace advocacy group established to counter the influence of the conservative Israel lobby in Washington. But that is what they remained, and more recently had expanded settlements and engendered among Palestinians feelings of impotence and hatred. Millions of people on both sides had become hostages to extremism, caught in a cycle of reprisals against one another. To him, it seemed every development in the Israel/Palestinian relationship over recent years had lessened the chances for peace. “And in September, over 140 members of the U.N. General Assembly will recognize a Palestinian state whose territory includes the West Bank, Gaza and West Jerusalem, further isolating Israel and deferring a genuine solution,” he said. This would likely trigger a “cynical” move by Republicans in Congress, cutting off all aid to Palestinians on the West Bank in order to attract money and votes from hardline supporters of Israel. 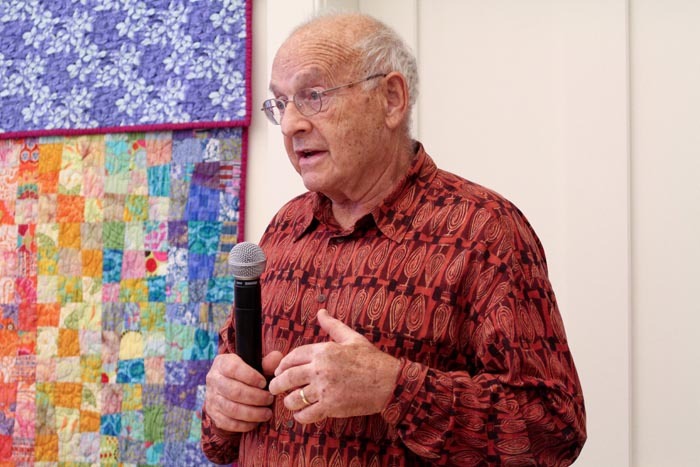 That in turn would “almost certainly see more frustration among Palestinians, and more hatred of America and Israel,” Mr. North Patterson said. “Some experts even fear that it will embolden [Israeli Prime Minister Bejamin] Netanyahu to annex land now occupied by Palestinians, destroying any chance for the revival of peace talks,” he said. Mr. Patterson quoted America’s respected military man, Gen. David Petraeus, that the enduring hostilities between Israel and its neighbors worked against American interests. He said America was perceived as favoring Israel, which limited this country’s partnerships in the region, weakened moderate Arab regimes, and increased the influence of Al Qaeda and other militant groups and Iran. These considerations, as well as the recent foment in Arab nations in North Africa and the Middle East, which would lead to the establishment of democratic governments more hostile to Israel, made a near-term peace deal essential. While he conceded that historically much of the blame for the failure to achieve peace rested with the Palestinian leadership, much of it now could be pinned on Prime Minister Netanyahu and his right-wing coalition government. Nonetheless, he said, America must increase its efforts to broker peace, on terms similar to those of the 2000 Camp David accords, with two states based on pre-1967 borders, with some land swaps, a fair division of Jerusalem, security guarantees for Israel, an international force to patrol the new borders, and allowing at least a small number of Palestinians to return to Israel, with others assisted to move to other countries. There really was no alternative compatible with Israel remaining a Jewish democracy, he suggested. “If Israel occupies the West Bank in perpetuity, denying Palestinians the rights of citizens, it cannot be a democracy; if it incorporates them, it will cease to be a Jewish state,” he said. And it is past time for the United States to say it stands with those American supporters of Israel — the great majority — who appreciate the moral and strategic necessity of a Palestinian state, and the terrible cost to both Israel and America of continued Israeli occupation,” Mr. North Patterson said. But how could the U.S. do that, in the current polarized climate? Arnold Zack, a Harvard Law School arbitrator and mediator with long professional experience, mostly in management and labor issues, suggested President Obama had established some good credentials as a broker. He said the President won credit with the Muslim world through deft handling of the issues of the Arab uprisings this year. But he agreed the perception that the U.S. has always favored Israel was an obstacle. He suggested that America should not oppose the Palestinian move in the United Nations for recognition of its statehood. “To the extent that we support Israel, we undermine our ability to be a mediator,” he said. He also said the real problem now is the current Israeli regime. He compared the Netanyahu government to the Tea Party wing of the Republicans in America in their refusal to consider compromise. Nor should parties set preconditions for negotiation, as Israel insisted on doing, he said. All things, no matter how frivolous they might seem, must be on table. And finally, he insisted that the negotiations must be private, not conducted via the megaphone of the media. “In the best of worlds, we won’t know anything about those negotiations until we have a resolution,” he said. 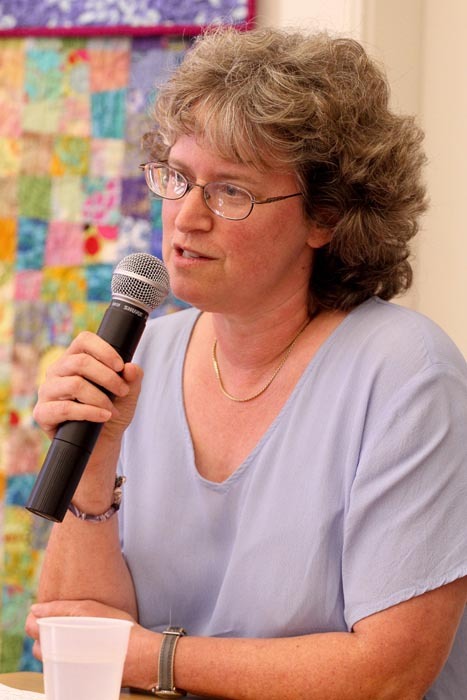 Vineyard Rabbi Caryn Broitman looked for the positives in the current moves, saying that at least Palestinians’ appeal to the United Nations is a nonviolent tactic. Likewise other protests in Israel, like the boycotts of products from Israeli settlements which had been organized. One might not agree with them, but they should not be condemned because they were peaceful, the rabbi said. She also drew some hope from the debate she heard during five months in Israel last year. It was very nuanced and lively, she said, compared with the “impoverished” views of many Americans who were either pro or anti-Israel. She related the story of a woman who approached her in synagogue recently, asking her view of the United Nations move. As the leader of a congregation encompassing many different views, she couched her answer carefully. The woman surprised her by declaring that the status quo in Israel could not be supported, and any change had to be contemplated seriously. Rabbi Broitman noted that Biblical prophets were never “yes people” and gave her endorsement of the J Street project as a healthy contributor to the debate about Israel’s direction. She drew laughs with her observation that it was “very Jewish” to argue. And after the speakers finished, when it came time for comment from the audience, there was in fact argument. Not all in the crowd were supporters of the J Street view or that of the panelists. 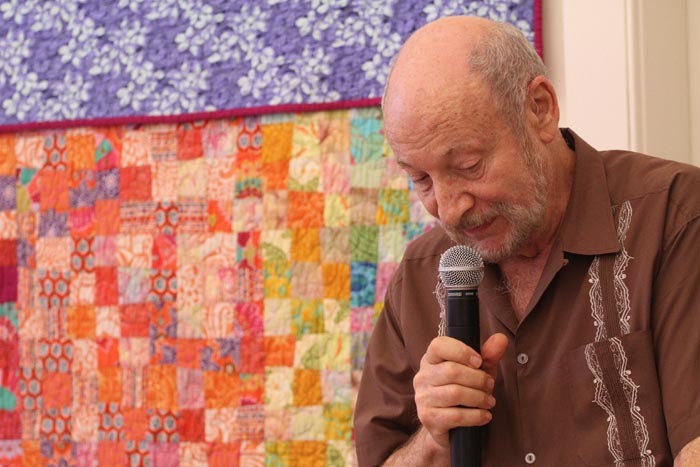 The event was supposed to end with the larger group breaking into smaller ones, to consider the ways in which America might help Israel and Palestine move toward peace. But that did not happen. As the audience continued to ask questions of the panel, and make comments from a wide range of ideological positions, from the overtly hawkish to one man who considered Israel already to be an undemocratic theocracy, people began to drift out. And the evening was over, but discussion lingered in the air of a summer evening.